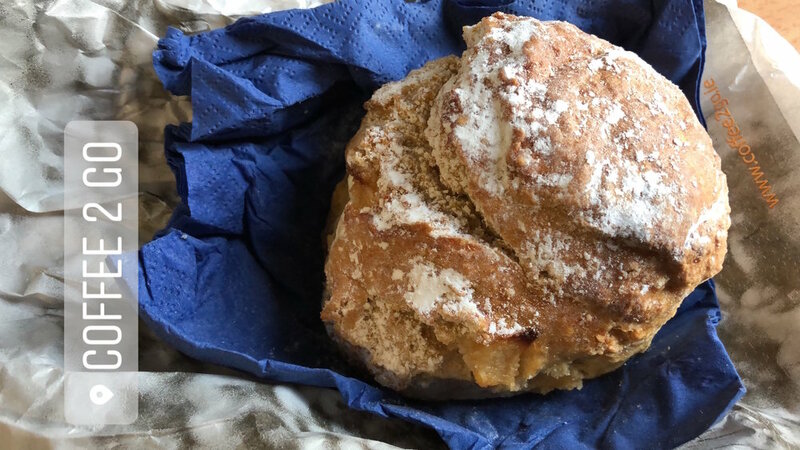 As I am already missing the beautiful city of Dublin, I decided to share my search for the best scones in Dublin during my semester there. بما أني مشتاقة للمدينة الأجمل دبلن، قررت أشارك بحثي عن أفضل سكونز بدبلن خلال الفصل إلي قضيته هناك. 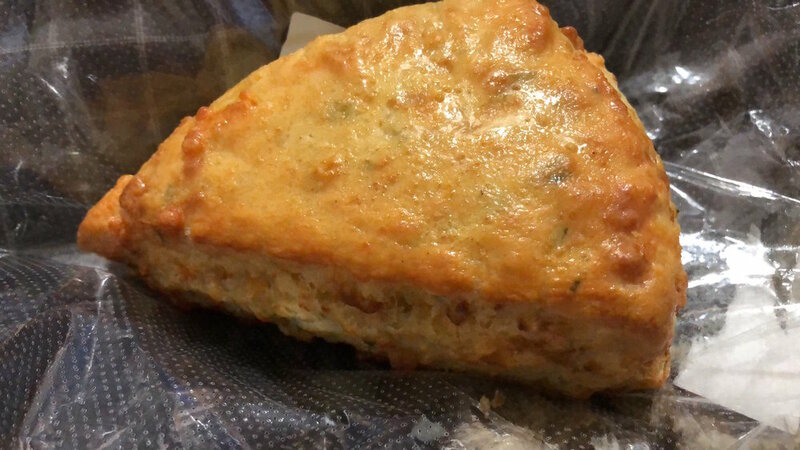 Scones are baked treats prepared from wheat or oatmeal and usually have a round shape but sometimes cut into triangles. They can be found plain, savory with cheese, onions,…, or sweet with raisins, fruits, or chocolate chips. السكونز هم مخبوزات بتتحضر من القمح أو الشوفان وبتكون بشكل دائري بالعادة أو يقطع لمثلثات في بعض الأحيان. السكونز إما بكونو سادة، مالحين مع جبنة، بصل،... أو حلو مع زبيب، فواكه، أو قطع الشوكولاته. I have always been a huge fan of scones but there are not that common in Vancouver or Ramallah. But in Dublin, there literally everywhere! Whatever you are eating, wherever you going you will find a basket of scones to grab. They are specifically common in Ireland, Scotland and England as a breakfast staple or for afternoon tea. أنا كنت دائماً من محبين السكونز بس ما كانوا شائعين في فانكوفر أو رام الله. بس في دبلن، موجودين بكل مكان! شو ما بتاكل ووين ما تروح بكون في سلة من السكونز. هم مشهوريين في إيرلندا، سكوتلندا، وإنجلترا على وجبة الفطور أو مع الشاي. 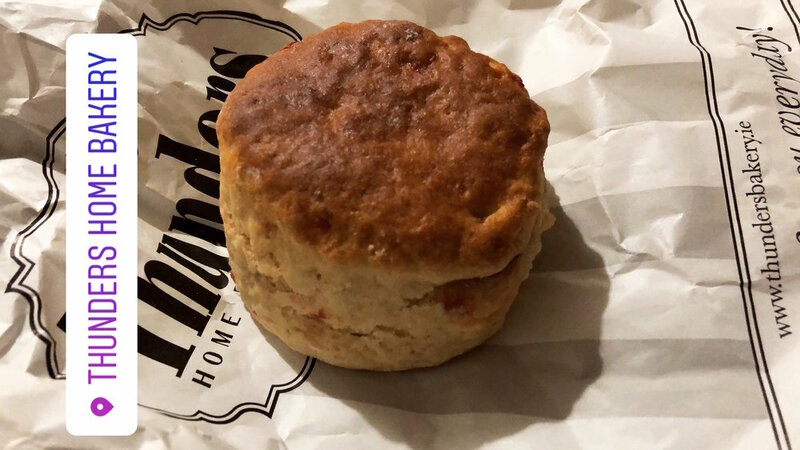 I was always looking for new, unusual flavors so I did my research on the best scones in Dublin and started my journey. أنا دائماً ببحث عن نكهات جديدة وغريبة فسألت وبلشت رحلتي للبحث عن أفضل سكونز في دبلن. While scones are usually eaten with butter and jam, I, weirdly, like to eat it on its own with a huge cup of tea. السكونز بالعادة بتتقدم مع الزبدة والمربى بس أنا، بغرابتي، بحب أكلهم بدون أي اشي مع كاسة شاي كبيرة. 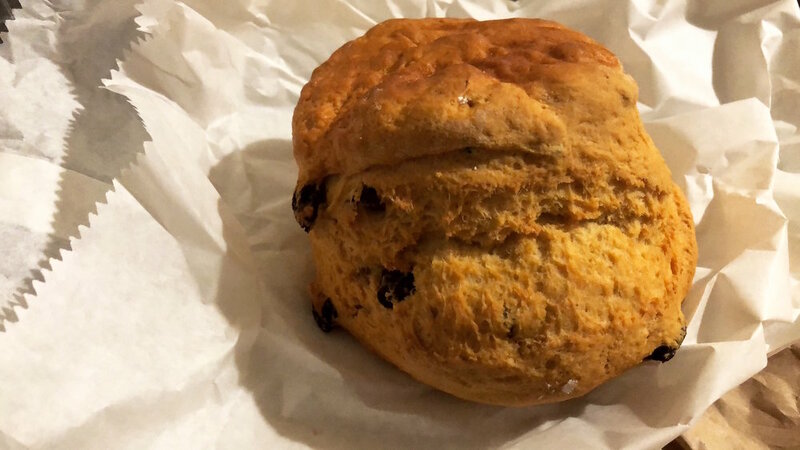 My very first scone in Dublin was a blueberry scone from BAKED. A small bakery/café in a shopping center so I was not expecting much. But this was a good scone; full of fresh blueberries, not very doughy, and a huge size. #10- Some special ones were from The Birdcage bakery (a raisin scone), Hansel and Gretel (I'd recommend their muffins more-a white chocolate raspberry muffin- OUT OF THIS WORLD), Kilkenny café (high quality scones), Voila (as elegant as its name- raspberry scone), coffee 2 go (go for unusual flavors-vanilla and pear for me), Bear Market (blueberry scones are the best! ), Ann's bakery (my first brown scone with fruits). #١٠- جربت سكونز مميزين من بيردكيج (بالزبيب)، هانسل وجريتيل (المافنز عندهم أزكى-خصوصاً مافن الرازبري)، كلينكي، فيولا، كوفي تو جو (نكهات غير عادية)، بير ماركت، وأنز بيكري. I also tried other scones like Thunders home bakery cherry scone (real fresh cherries),tesco's (because why not? ), Encore café raisin scone (surprisingly good). كمان جربت سكونز من ثاندرز هوم بيكري (بالكرز)، تيسكو، وكافيه انكور. #9- Queen of tarts was mentioned as having the best scones- I tried their raisins scone-definitely unique but not up to the expectations. #٩- كوين اوف تارتس مذكور بأنه عنده أفضل سكونز- جربن سكونز الزبيب- مميزين بس مش مثل التوقعات. 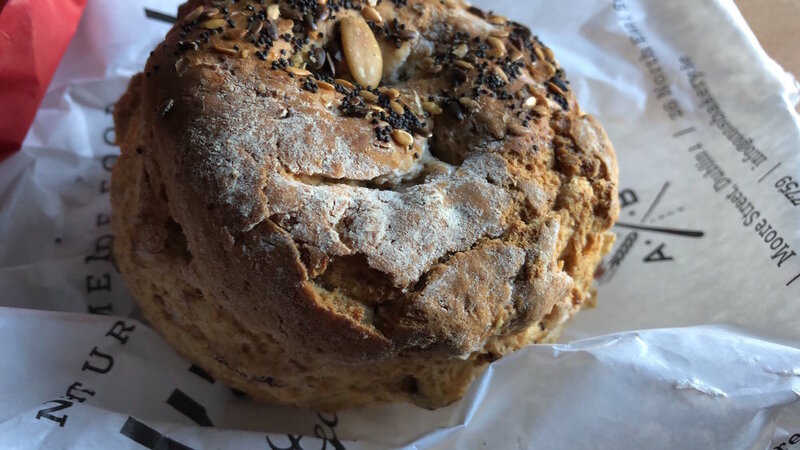 #8- Avoca: this is a dear place to my heart and I loved it more when they had savory scones- sundried tomato and cheese scone covered with seeds. Their mixed berries scone was also great with a hint of vanilla. #٨- أفوكا: كان من الأماكن المفضلة عندي وخصوصاً أنه بقدم سكونز مالحة- بالبندورة المجففة والجبنة مغطى بالبذور. سكونز البيري كانت لذيذة كمان مع نكهة الفانيلا. #7- A famous name was The Bretzel Bakery- after a long line I tried their fresh raspberries scone bursting with the berries flavor! #٧- من الأسماء المشهورة كانت بريتزل بيكيري- بعد انتظار طويل جربت سكونز الرازبيري الطازجة. 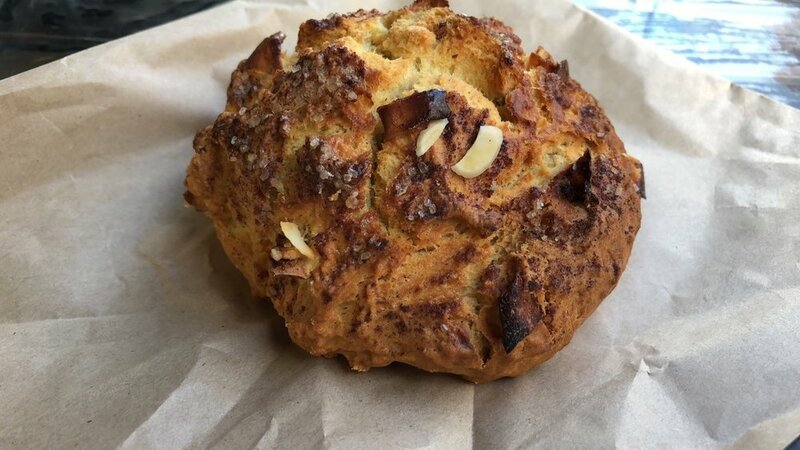 #6- This delicious apple & cinnamon scone from Beanhive (this place has unique flavors). #٦- سكونز التفاح والقرفة اللذيذة من بين هايف (عنده نكهات مميزة). 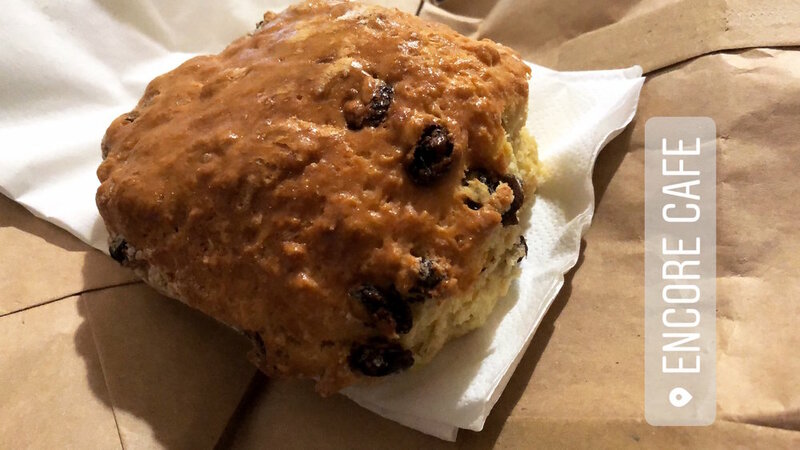 #5- Another raisin scone from Peacockgreen co. - while a bit overpriced, this scone stands out- especially with a hint of vanilla. #٥- كمان سكونز زبيب من بيكوك جرين اند كو- مع أنه أعلى من غيره، هأي السكونز بتتميز خصوصاً مع نكهة الفانيلا. 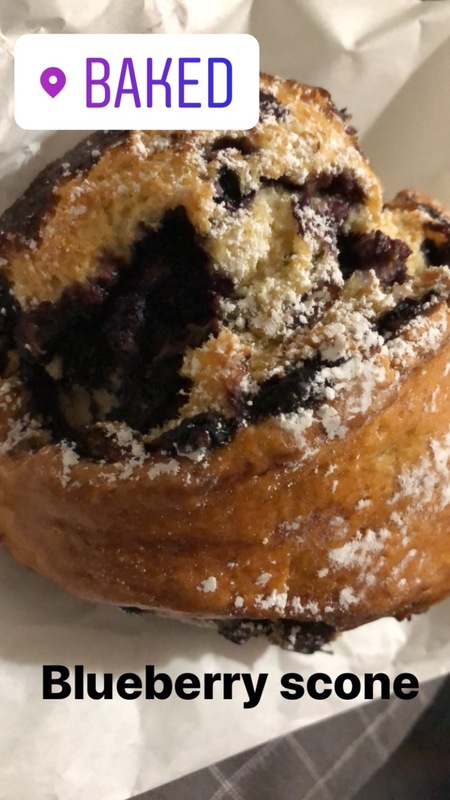 #3- A special scone from Le petit parisian-blueberry coconut scone- I've never been to Paris but I am sure this tastes like Paris! #٣- سكونز مميزة من لي بيتيت باريزيان- بلوبيري مع جوز الهند- ولا عمري زرت باريس بس أكيد هيك طعمها! 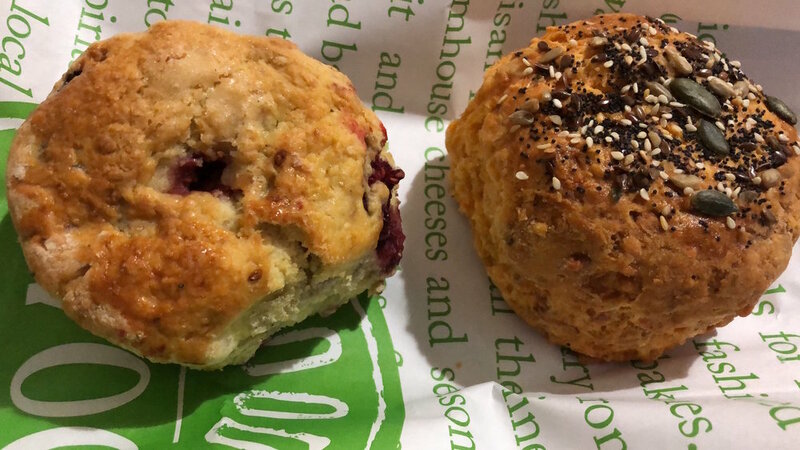 #2- Keogh's is known for its scones and muffins; they have many flavor options- Trying their raspberry and vanilla and pear scones- their scones are like no scone- not doughy at all with the perfect crumble (their muffins are delicious too!). #٢- كيوجز معروف بالسكونز والمافنز وعندهم نكهات مختلفة. جربن سكونز الرازبيري وسكونز الأجاص والفانيلا- سكونز مش عادية مع قرمشة مثالية (المافنز زاكيين كمان!). #1- Brewbaker- their sign says they have the best scones in Dublin,THEY DO. Not your typical scone, topped with crumble, and full of blueberries. #١- بروبيكر- لوحتهم بتقول أنهم أفضل سكونز في دبلن- وهم فعلاً هيك! مش أي سكونز عادية، مقرمشة، وكلها بلوبيري.